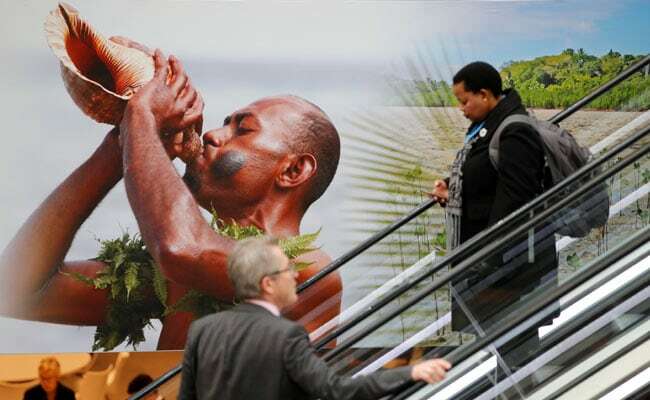 The chair of the conference Fiji - a small island state which itself is highly vulnerable to climate impacts - hasn't put enough pressure on rich countries, developing nations say. A transparent assessment of the actions of the developed countries is off the table at Bonn. Bonn: The climate conference in Germany's Bonn is not making any progress and the talks in their second week are already stuck. Last week, as the formal talks began, developing countries including India and China were left stunned when Fiji, which is presiding over the negotiations, allowed developed nations to get away without any assessment of their performance towards their commitment on reducing carbon emission before the year 2020 and helping poor and developing countries with finance and technology. In 2015, almost 200 countries signed the historic Paris Agreement on Climate Change, which gets operational in 2020. As per the deal, all countries have to put forward a plan to reduce emissions and developed countries are also required to provide financial and technological support to the developing world. Under the "pre-2020 commitments", developed countries have to tell the world what they have done to reduce their carbon emissions till now and how they will achieve their previous target. The European Union claims that they are on track to meet their emission reduction target of 20 per cent by 2020 pledged in 2010. However, as per the bargain, EU offered to enhance their target to 30 per cent if all countries come together a global deal. As per their own estimates, they have only made 23 per cent reduction which leaves a substantive gap. 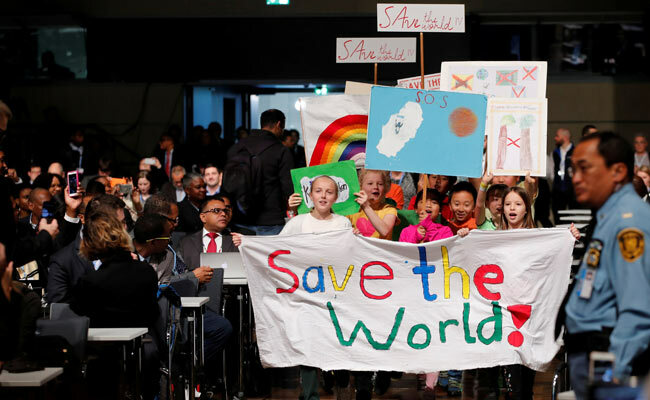 Children at the climate march prior to the opening session of the COP23 UN Climate Change Conference. 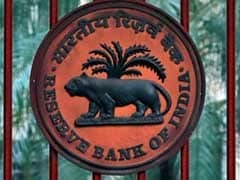 There is no transparent assessment of the actions of the developed countries, which is one of the key demands of India and other developing countries. USA - which announced earlier this year to withdraw from Paris deal - joined the EU and other developed countries to not allow any measuring of progress on pre-2020 discussions. "Developed countries are asking us (the developing countries) to take more steps to combat climate change but they are not even ready to tell what they have done," said one of the negotiators from a developing country who requested not to be named. The issue remains unresolved until now and is likely to go to the ministers when they arrive this week. Another key issue which hasn't made much progress in the Bonn climate conference is climate finance. United States is blocking the progress across the board. Sources say that rich countries including Japan, Australia, Canada and the European Union are "hiding" behind the US to avoid shelling out money to developing countries. Under the Paris Agreement, developed countries are supposed to mobilize 100 billion dollars per year by 2020 to help the developing and poor countries to combat the effects of climate change and adopt greener development pathways. 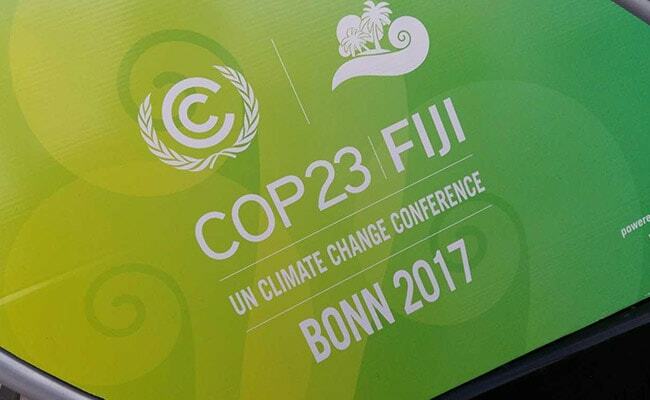 A placard prior to the COP23 UN Climate Change Conference 2017, hosted by Fiji but held in Bonn. But there is hardly any progress on this front. The contention remains about the definition of climate finance. "Last year, developed countries had proposed a plan of 100 billion dollar which has a botched up methodology and cooked up numbers," said a source closely watching the negotiations. Developing countries are saying that transparency is of utmost important in long term finance. "All developing countries, including India, are suffering from the impacts of climate change. We have seen how this is affecting our agriculture and several climate sensitive sectors, hence urgent actions are needed to reduce emissions reduction and provide finance and technology to developing countries," said Ram Kishan, South Asian Humanitarian Manager of Christian Aid. How to deal with loss and damage due to climate change has also emerged as a sticking point. Developing countries, particularly the poor ones, are demanding for financial and other means to address the increasing climate impacts such as hurricanes, droughts, seal level rise and glacier melt. Expert bodies including the Inter-governmental Panel on Climate Change (IPCC) have associated increasing extreme weather events and rising sea levels to human induced global warming. Ironically, Fiji - a small island state which itself is highly vulnerable to climate impacts - hasn't put enough pressure on rich countries, developing nations say. "It is extremely painful to see that vulnerable countries have to fight for a substantive discussion on loss and damage in these formal sessions. Their demand is have it as a permanent agenda item in the forthcoming climate talks and there is a clear and robust way to find sources of finance and make it available to developing countries," says Harjeet Singh, Global Lead on Climate Change for ActionAid.